Axis Of Oversteer: Curious about the BMW Concept 5 GT? Curious about the BMW Concept 5 GT? Everything you could possibly want to know about the 5GT, after the jump ...>. A BMW with driving dynamics, compelling style, and versatility; the BMW Concept 5 Series Gran Turismo. Woodcliff Lake, NJ - EMBARGOED UNTIL: February 13, 2009, 12:00PM EST... With the BMW Concept 5 Series Gran Turismo, BMW opens a new segment in the automobile market by incorporating BMW driving dynamics, quality, and style into a new type of vehicle. As was the case with the BMW X5 as the world’s first Sports Activity Vehicle and the BMW 1 Series, to this day the only rear-wheel-drive premium small car, BMW is again developing a new market segment and giving additional driver groups the unique experience of The Ultimate Driving Machine. The BMW Concept 5 Series Gran Turismo is the production-destined rendition of the Progressive Activity Sedan (PAS) development idea. For the first time, this concept car combines the looks and appearance of a sporty BMW Sedan, a modern Sports Activity Vehicle, and a classic Gran Turismo. Perhaps the most outstanding feature of the BMW Concept 5 Series Gran Turismo is its combination of stylish quality, luxurious comfort, and remarkable convenience. As the name indicates, the BMW Concept 5 Series Gran Turismo is the ideal car for long journeys while still offering a dynamic driving experience in everyday traffic or short jaunts. The design of the body presents the character of a BMW dedicated to sporting performance. A brilliant concept for modern mobility. The BMW Concept 5 Series Gran Turismo conveys modern mobility by focusing on the requirements of a discerning driver who appreciates first-class ambience and enjoys all the benefits of a flexible interior. With this in mind, the BMW Concept 5 Series Gran Turismo projects an individual flair oriented to each occupant’s needs and preferences. Such flair makes it possible to win over new driver groups for BMW. The BMW Concept 5 Series Gran Turismo is an attractive offer to the driver wishing to retain classic features such as presence, luxury, and quality while living a versatile and spontaneous lifestyle. The interior of the BMW Concept 5 Series Gran Turismo combines spaciousness, personal luxury, and an exquisite choice of materials to provide a first-class experience. The entryways allow ergonomically ideal access to all seats, the driver-oriented design of the cockpit, in typical BMW fashion, suggests sporty performance, and the slightly elevated seating position promotes good outward visibility. Unique design in the rear provides a modern, generous atmosphere. With the rear seats adjustable fore-aft by up to 4”, both legroom and the seat angle may be set to the preferences of the passengers. Headroom is virtually the same as in the BMW X5, giving driver and passengers a genuinely comfortable experience. Luxury, comfort, and impressive usefulness. With the rear seats slid aft, legroom will be roughly the same as in the BMW 7 Series and luggage capacity amounts to 15.1 cubic feet. With the rear seats moved forward and the rear bulkhead partition opened, luggage capacity increases to almost 20 cubic feet. Even in this position, legroom in the rear still meets the demands for a full-size sedan. After completely folding the rear seats as well as the bulkhead partition leading to the luggage compartment, large and bulky objects may be loaded into the rear. With the bulkhead partition stowed in the floor of the luggage compartment, maximum luggage capacity becomes nearly 58 cubic feet. For convenience, the rear seats fold by pushing a button on the side panel of the luggage compartment. The option to fold down the rear seats individually provides even greater flexibility. Optimum visibility thanks to the elevated seating position. In the front seats, both driver and passenger benefit from a slightly elevated seating position. This “semi-command” seating position offers an optimum outward view, much like in the BMW SAV models. Elegant interior design accents the unique feeling of space. In the cockpit, the horizontally arranged, cascade-like surfaces finished in different materials strongly accentuate the width of BMW’s new concept car. The displays and controls are grouped according to their functions. Through its design, the instrument panel enhances the very good visibility provided by the elevated seating position, giving the driver a clear view from above of the control elements for the lights and the start/stop button on the middle level. Also important in this context, the horizontal orientation of the entire cockpit accentuates the generous character of the interior. The trim bar stretching out as an arch through the entire width of the instrument panel continues into the door panels. The interaction of ascending and descending lines throughout the interior optically connects the front and rear seats. All lines and surfaces, finished with sophisticated materials, taper out behind the rear seats, and give the interior its comfortable and spacious character. The flow of lines, uninterrupted by the B-pillar, emphasizes the length of the interior. Last but not least, the feeling of spaciousness is augmented by the center console, which extends all the way to the rear. Special concept materials and colors within the interior. The colors and materials for the interior further enhance the impression of personal luxury and the interplay of surfaces and lines. All surfaces within the interior are finished in high-quality natural leather, the surfaces on the seats and the door armrests form a “comfort zone” in Glacier White leather. This creates the impression of a bright brand extending around the lower section of the instrument panel, the cool and elegant color giving particular emphasis to the generous and luxurious feeling of space. The bright surfaces in the comfort zone are surrounded by a dark, warm reddish brown, this special color referred to as Copper Brown providing a smooth link to the exterior paintwork. The impression of modern luxury is further enhanced through the use of authentic materials such as polished billet metal and ceramic elements. The quality of the interior finish is borne out particularly by the solid wood trim with metal inlays extending generously across the instrument panel. Instrument cluster with color display in black panel technology. The instrument cluster of the BMW Concept 5 Series Gran Turismo is a high-resolution color display in black panel technology presenting the four round instruments in traditional sports car style, including status displays, navigation data, and information from the Check Control. Introduced in the new BMW 7 Series, black panel technology ensures precise and sophisticated presentation of the instruments and displays. In Rest mode the entire panel forms a homogeneous black surface. When activated, the numbers on the circular instruments are generated electronically along with other symbols on the display. The iDrive Control Display screen, arranged on the same plane as the instrument cluster, is integrated into the dashboard as a free-standing element. The Control Display forms one common design unit with the black panel and houses the controls for the audio system and climate. For optical purposes, this unit is separated by the horizontal trim bar with its central ventilation grid and a storage box. In the BMW Concept 5 Series Gran Turismo, the special look of black panel technology continues into the center console: dynamism in typical BMW style combined with the elegance of a Gran Turismo. The body design of the BMW Concept 5 Series Gran Turismo ensures an exciting balance of innovation and tradition. The concept car stands out as a genuine BMW, as the overall look of the exterior clearly alludes to the extension of BMW’s model portfolio made by this unique automobile. Indeed, the BMW Concept 5 Series Gran Turismo enters new terrain in the history of The Ultimate Driving Machine. In its exterior dimensions the BMW Concept 5 Series Gran Turismo fits perfectly between the BMW 7 Series and BMW’s various SAV models. Its length of 196.8" is second only within the BMW model range to the 7 Series, while the car’s height of 61.2" is exceeded only by BMW’s X models. The width is 74.8” and the wheelbase is 120.9”. The characteristic look of the BMW Concept 5 Series Gran Turismo results from the car’s proportions - the long hood, long wheelbase, and the greenhouse moved aft bear out the athletic characteristics of a BMW. These features are combined with elements that highlight the qualities of the new concept; the large passenger cell bears testimony to the luxurious, versatile interior. The coupe-like roofline extends into the spoiler at the rear, and represents the sporting elegance of a Gran Turismo. Paintwork in Fluid Cuprite, a new color developed specifically for this concept car, again highlights the unique design of the BMW Concept 5 Series Gran Turismo. The extremely fine surface flair reminiscent of liquid metal impressively models the surfaces on the body through its powerful contours. And to provide an appropriate supplementary touch, the brake calipers and the inner surfaces on the exhaust gas tailpipes are finished in a new color called Copper. Front view with forward-pushing motion. The front view of the BMW Concept 5 Series Gran Turismo is characterized in particular by the strong presence of the low-slung BMW kidney grille, the large lower air intake, and BMW’s characteristic dual round headlights. The BMW kidney grille is slanted slightly forward, its upper edge marking the foremost point on the body. The kidney grille is further accentuated by surrounding surfaces. All contour lines flowing along the engine compartment out of the fenders aim at the kidney grille at the front of the car. The air intake, in turn, is lower in the middle where it extends beneath the kidney grille. And last but not least the contours on the headlight units taper out smoothly towards the middle of the car. Just as the size of the BMW kidney grille demonstrates the engine’s need for cooling air, the power dome in the middle of the engine compartment lid emphasizes the sheer muscle of the engine itself. The outer flanks of the hood facing downward form a cascade-like contour together with the widely flared wheel arches, giving the front view of the BMW Concept 5 Series Gran Turismo a wide and powerful look. The frontal impression is further enhanced by the foglamps positioned at the outer edges of the lower air intake, while the aluminum bars separating the two outer elements on the air intake and extending beyond the foglamps further enhance the look of width at the front. Dual round headlights typical of BMW; new LED corona rings. The dual round headlights typical of a BMW come with new contour lines and a new technology for the daytime running lights on the BMW Concept 5 Series Gran Turismo. Slanted to a distinctive angle and extending far into the fenders, the headlight units are highlighted by surrounding bars, the headlights themselves cylindrical in shape bordering at the top on a matte headlight cover. This emphasizes the unique look of the front end, with its clear, penetrating focus. Apart from the turn signals, the new LED corona rings for the daytime running lights generate bright, even light. Side-view: coupe-like roofline and waistline emphasizing the sleek elegance of the car. Appropriate lines along the side create the harmonious symbiosis of the front end, the side view and the rear section on the BMW Concept 5 Series Gran Turismo. The dominating feature from the side is the character line of a BMW extending from the outer edge of the headlights and moving back at the same level as the door handles along the entire length of the car, rising up slightly in the process and continuing into the contours of the rear light clusters. The equally striking sill-line continues into the upper edge around the air intake at the front and the contour in the rear diffuser, this interplay of the waistline and the sill-line making the car look lower and more crouched down on the ground and emphasizing the dynamic wedge of the body. The unusual presence of a coupe-like roofline adds character to the car’s design and is a visual expression of the features and qualities the car has to offer. With its sporting flair, the BMW Concept 5 Series Gran Turismo leaves a positive impression through its spacious and generous interior. The BMW Concept 5 Series Gran Turismo comes with frameless doors, a feature of particularly sporting cars now to be admired for the first time on a 4-door BMW. The door cutout bars are another special feature, forming one unit across both entry areas and thus corresponding with the overall harmonious flair conveyed by the door panels inside the car. Large, flared wheel arches symbolize the sporting potential of the car: The BMW Concept 5 Series Gran Turismo showcases 21-inch light-alloy wheels offering excitement and elegance through their unique multi-spoke design. Yet another feature of particularly sporting cars the short overhang, which keeps the fenders low and long. This effect is further intensified by the horizontal lines of the car borne out by the waistline as well as the joint and contour line on the engine compartment. The “Hofmeister kink” re-interpreted in modern style. The design of the side windows also presents a re-interpretation of a classic BMW feature: on the BMW Concept 5 Series Gran Turismo the window surrounds are one-piece, this three-dimensional shape giving the aluminum frame a sophisticated and dynamic look around the famous “Hofmeister kink”. The exterior mirrors also represent a new design element, with the mirror base forming part of the foot of the A-pillars and thus blending harmoniously with the fender of the car. The BMW Concept 5 Series Gran Turismo offers a new rendition of the “Hofmeister kink.” In this case the inner radius of the “kink” is particularly large, the outer radius strikingly small. This creates an exciting contrast to the roofline moving down smoothly and gently to the rear. The design of the rear end offers a striking impression of this unique concept with its exceptional strengths and features. The two outer roofline as well as the shoulder lines merge into the spoiler on the tailgate, giving the rear in its fastback style a surrounding line while adding a compact touch to the car. The rear view of the BMW Concept 5 Series Gran Turismo is split by horizontal lines highlighting the width and powerful stance of the car. The rear reaches its full width around the wheel arches, with exhaust tailpipes positioned far to the outside also directing the eyes to the wheels. The distinctive light edge in the lower part of the bumper adds a further touch, while a diffuser finished in black marks the gap between the rear valence and the road. Impressive versatility: two tailgates in one. With the rear panel of the car appearing to start directly beneath the rear light clusters in order to convey a sporting impression, the low loading sill on the BMW Concept 5 Series Gran Turismo is not visible at first sight. Another innovation crucial to the mission of the car is only recognizable when opening the rear hatch: To stow luggage, the bi-modal trunk may be opened in traditional fashion or the entire hatch may be opened to load larger objects. When only the lower section is opened, one loads the luggage compartment as in a sedan, benefiting in the process from the low loading sill. Using the trunk in this way keeps the interior of the vehicle from being disturbed by outside climate effects. The L-shape of the rear light clusters typical of a BMW is re-interpreted on the BMW Concept 5 Series Gran Turismo, with the two rows of light following a dynamic sweeping motion. The rear lights extend far into the side panel, emphasizing the full width of the BMW Concept 5 Series Gran Turismo even at night. The rear light clusters are connected by a chrome bar continuing from the waistline at the side into the line extending into the rear lights and thus accentuating the width of the rear end. 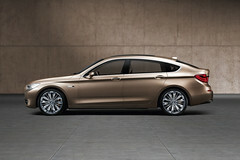 BMW Concept 5 Series Gran Turismo: new momentum in a demanding market. With the BMW Concept 5 Series Gran Turismo, BMW is again demonstrating its ability to develop innovative vehicle concepts. The world’s most successful manufacturer of premium cars follows the challenges created by the need for up-to-date mobility solutions. This new concept addresses a demanding driver group seeking to combine style, luxury, and impressive versatility with individual style, while meeting the demands and requirements of an active lifestyle. The BMW Concept 5 Series Gran Turismo offers these qualities and reaches beyond BMW’s existing customer groups. The BMW Concept 5 Series Gran Turismo thus stands out as a modern interpretation of the Gran Turismo segment so rich in tradition, cars which at all times have combined athletic driving qualities with a truly comfortable interior. Stylish elegance, luxurious spaciousness, and impressive versatility all come together in the BMW Concept 5 Series Gran Turismo. Features never before combined in one car make the new concept a truly progressive innovation serving ideally to set new standards in the most demanding upper midrange segment. Establishing a new vehicle segment in this process, BMW is continuing its successful development strategy. Qualities typical of the brand are again carried into a new market with an innovative concept. Hence, BMW is using all of its innovative power to give new customers that unique thrill of The Ultimate Driving Machine® and to continue the ongoing growth of BMW in a lasting, long-term process. • With the future still offering sufficient room for an exciting new driving experience, BMW has once again defined a brand-new vehicle segment: The BMW Concept 5 Series Gran Turismo is the series-based adaptation of the Progressive Activity Sedan (PAS) in the premium midsize segment via a new concept. • With its stylish appearance and comfortable driving experience, the BMW Concept 5 Series Gran Turismo transfers the characteristics of a classic Gran Turismo to a very special four-door vehicle with four seats. These typical features of a Gran Turismo are then enriched by the highest standard of intelligent, versatile functionality. • The BMW Concept 5 Series Gran Turismo combines style, space, comfort, and versatility. In a combination never seen before, the features of a prestigious sedan, a modern and versatile Sports Activity Vehicle, and a classic Gran Turismo are all united in this unique Concept Car. • Besides the typical BMW proportions, the coupe-like roofline accentuates the stylish, sporty character of the car and the sheer length of the car’s body. In addition, the BMW Concept 5 Series Gran Turismo has four frameless windows and striking aluminum trim. • The interior is surprisingly generous considering the coupe-like silhouette of the car, creating a spontaneous feeling of luxury for driver and passengers. This impression is further enhanced by the slightly elevated seating position, and the panorama roof provides a particularly pleasant travel experience. • The BMW Concept 5 Series Gran Turismo is highly versatile: a flexible interior comprised of the rear seats, the bulkhead partition, and the luggage compartment allows the adjustment of the interior to personal requirements – from a separate luggage compartment, as in a sedan, all the way to a capacity of almost 58 cubic feet with the rear seats folded down. This flexibility is rounded off by a bi-modal hatch with separate openings for additional convenience. • The BMW Concept 5 Series Gran Turismo addresses a demanding and modern driver group – discerning individuals who attach great importance to genuine style, luxurious comfort and flexibility in use. This gives BMW the opportunity to win over customers who currently drive a sedan, SUV, or wagon model in the respective competitive segments. • The BMW Concept 5 Series Gran Turismo extends the BMW model range through a fresh, intelligent vehicle concept for modern mobility at the highest standard. Through its unique combination of style, space, comfort, and variability, the car creates a powerful impression of relaxed presence. Indeed, these new characteristics enrich the driving experience to a higher standard and appeal to new groups of drivers. Last but not least, the BMW Concept 5 Series Gran Turismo authentically projects quality and a new standard of sporting performance borne out by the car’s dynamism and efficiency. • The BMW Concept 5 Series Gran Turismo offers a spacious and luxurious ambience with inspiring and modern interior design. As the world’s only combination of variable spaciousness and uncompromising premium quality, this new concept car also stands out through the most sophisticated materials and excellent quality of finish. Supreme harmony in interior design, reflected by the trim surfaces extending from the front to the rear doors, creates a modern symbiosis of the two seats at the front and the seats at the rear. The panorama glass roof, in turn, further intensifies the light and generous ambience inside the car, while the stylish cockpit emphasizes the sheer width of the vehicle through its horizontal lines, black panel technology and a fully integrated 10.2-inch Control Display. • Seating comfort, ample headroom and elbow room in the front provide the standard of a luxury performance automobile, the slightly elevated seating position ensures an optimum overview and makes access to the car particularly comfortable. Tilted slightly to the front, the instrument panel, finally, optimizes the degree of control comfort on the driver’s seat. • Optimized access as well as freedom of movement characterize the generous atmosphere in the rear seats. Extending to the rear, the center console in the concept car emphasizes the length of the interior. Outstanding versatility, in turn, is ensured by single seats at the rear. Adjustable fore-and-aft, their backrests folding forwards individually under electric power and the adjustable backrest angle ensure comfort. • With the rear seats in their regular position, the BMW Concept 5 Series Gran Turismo offers the passengers at the rear the same legroom as in the BMW 7 Series and virtually the same headroom as in the BMW X5. In this configuration, luggage compartment capacity is 15.1 cubic feet. The partition wall behind the rear seats separates the passenger and luggage compartments from one another in terms of both acoustics and climate conditions, like in a sedan. If necessary, the rear seats move fore-and-aft by more than 3.9" – so that with the seats moved as far forward as possible, the occupants still enjoy the same legroom as in the BMW 5 Series Sedan, with luggage capacity increasing to almost 20 cubic feet. Then, once folding down the rear seat backrests and the partition wall, the luggage compartment further increases in size to its maximum capacity of nearly 58 cubic feet. The firm cover on the luggage compartment may be stowed away in the floor of the compartment, again in the interest of extra convenience. • The two-piece tailgate allows unique variability in loading the luggage compartment: Opening the small, sedan-like tailgate beneath the rear window enables the driver and passengers, in combination with the closed partition wall, to load the luggage compartment without creating any drafts into the passenger compartment or changing the temperature the passengers wish to enjoy. To conveniently load bulky objects, all the driver has to do is open up the large hatch similar in its configuration to that of a Sports Activity Vehicle. • The BMW Concept 5 Series Gran Turismo combines the Gran Turismo with four doors and all the quality of a Sedan, and the versatility of a Sports Activity Vehicle. BMW proportions are borne out by the long hood, the long wheelbase, the coupe-like roofline, and the greenhouse moved rearward. • The dynamic character of the car’s front-end is accentuated by the large BMW kidney grille positioned low down and standing upright, as well as the large air intake.The dual round headlights give the front end of the car a particularly modern look. The corona rings come for the first time in LED technology. • From the side, the BMW Concept 5 Series Gran Turismo clearly visualizes its innovative character, the waistline and the coupe-like roofline accentuate the look of the car and the length of the body. Following the example of a coupe, the BMW Concept 5 Series Gran Turismo comes with four doors and frameless windows. The aluminum surrounds on the side windows are milled out of one solid unit and holding the elegantly designed exterior mirrors as yet another important design feature. Yet a further element on the side is the exciting re-interpretation of the famous “Hofmeister kink” typical of BMW at the rear end of the window. • Horizontal lines at the rear emphasize the width and sporting character of the car, accentuated by the waistline extending from the side into the rear panel, a three-dimensional chrome bar and the flared wheel arches. The outer rooflines merge into the spoiler and encompass the rear in its fastback design. The L-shaped rear light clusters come with horizontal rows of lights extending far round into the side of the car. BMW of North America, LLC has been present in the United States since 1975. Rolls-Royce Motor Cars NA, LLC began distributing vehicles in 2003. The BMW Group in the United States has grown to include marketing, sales, and financial service organizations for the BMW brand of motor vehicles, including motorcycles, the MINI brand, and the Rolls-Royce brand of Motor Cars; DesignworksUSA, a strategic design consultancy in California; a technology office in Silicon Valley and various other operations throughout the country. BMW Manufacturing Co., LLC in South Carolina is part of BMW Group’s global manufacturing network and is the exclusive manufacturing plant for all X5 Sports Activity Vehicles and X6 Sports Activity Coupes. The BMW Group sales organization is represented in the U.S. through networks of 338 BMW passenger car centers, 335 BMW Sports Activity Vehicle centers, 142 BMW motorcycle retailers, 83 MINI passenger car dealers, and 30 Rolls-Royce Motor Car dealers. BMW (US) Holding Corp., the BMW Group’s sales headquarters for North, Central and South America, is located in Woodcliff Lake, New Jersey. Yeah, someone please explain to me the point of this in the BMW lineup?